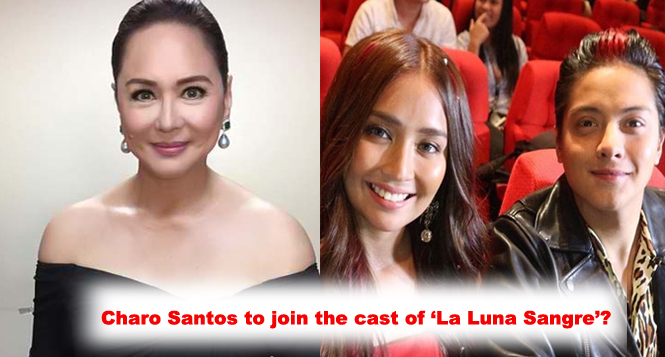 Netizens caught the attention of former ABS-CBN Corporation Chief Content Officer Charo Santos-Concio when she made an appearance in the top-rating primetime series 'La Luna Sangre' during its July 14 episode. The big boss of ABS-CBN and veteran actress-host effortlessly became a trending topic on twitter although it was only a photo of her that was shown to the viewers. She was introduced by Albert Martinez, who plays Proffesor Theodore Montemayor, as a vampire who has a position in the government as a Senator to the members of Moonchasers - a group who hunt vampires. In a recent interview with ABS-CBN reporter MJ Felipe, she talked about her photo cameo in the series. "I was in Europe, they told I was trending. So sinakyan ko na lang" she said, referring to her instagram post where it shows herself with John Lloyd Cruz and Piolo Pascual. When asked about the possibility of having a cameo appearance, she replied: "Why not? Who knows. Para maiba naman." 'La Luna Sangre' maintains its lead in nationwide ratings against its rival show 'My Love From the Star.' If she will join the cast, it will surely soar the ratings even higher.